Joon Dental Clinic Your journey to a better smile! Dental restorative materials are specially fabricated materials, designed for use as dental restorations (fillings), which are used to restore tooth structure loss, usually resulting from but not limited to dental caries (dental cavities). There are many challenges for the physical properties of the ideal dental restorative material. The goal of research and development is to develop the ideal restorative material. The ideal restorative material would be identical to natural tooth structure, in strength adherence and appearance. The properties of an ideal filling material can be divided into four categories: physical properties, biocompatibility, aesthetics and application. The physical properties include heat insulation n vital tooth is protected from thermal changes, resistance to different categories of forces and wear like attrition and abrasion, chemically resistance and avoid errosion plus must have bonding strength to the tooth. The material needs to withstand everyday masticatory forces and conditions on it without fatiguing. Biocompatibility refers to how well the material coexists with the biological equilibrium of the tooth and body systems. Since fillings are in close contact with mucosa, tooth, and pulp, biocompatibility is very important. Common problems with some of the current dental materials include allergies, chemical leakage from the material, and pulpal irritation. Some of the byproducts of the chemical reactions during different stages of material hardening need to be considered. Filling materials ideally would match the surrounding tooth structure in shade, translucency, and texture. Dental operators require materials that are easy to manipulate and shape, where the chemistry of any reactions that need to occur are predictable or controllable. The chemistry of the setting reaction for direct restorative materials is designed to be more biologically compatible. Heat and byproducts generated cannot damage the tooth or patient, since the reaction needs to take place while in contact with the tooth during restoration. This ultimately limits the strength of the materials, since harder materials need more energy to manipulate. Amalgam is a metallic filling material composed from a mixture of mercury (from 43% to 54%) and powdered alloy made mostly of silver, tin, zinc and copper commonly called the amalgam alloy. Amalgam does not adhere to tooth structure without the aid of cements, or techniques which lock in the filling, using the same principles as a dovetail joint. Amalgam is still used extensively in many parts of the world because of its cost effectiveness, superior strength and longevity. However their metallic colour is not aesthetic and tooth coloured alternatives are continually emerging with increasingly comparable properties. Due to the known toxicity of the element mercury, there is some controversy about the use of amalgams. Composite resin fillings (also called white fillings) are a mixture of powdered glass and plastic resin, and can be made to resemble the appearance of the natural tooth. They are strong, durable and cosmetically superior to silver or dark grey colored amalgam fillings. Composite resin fillings are usually more expensive than amalgam fillings. Bis-GMA based materials contain Bisphenol A, a known endocrine disrupter chemical, and may contribute to the development of breast cancer. PEX-based materials do not. Most modern composite resins are light-cured photopolymers, meaning that they harden with light exposure. They can then be polished to achieve maximum aesthetic results. Composite resins experience a very small amount of shrinkage upon curing, causing the material to pull away from the walls of the cavity preparation. This makes the tooth slightly more vulnerable to microleakage and recurrent decay. There are handling techniques combined with material selection,which minimize or eliminate microleakage. In some circumstances, less tooth structure can be removed compared to preparation for other dental materials such as amalgam and many of the indirect methods of restoration. This is because composite resins bind to enamel (and dentin too, although not as well) via a micromechanical bond. As conservation of tooth structure is a key ingredient in tooth preservation, many dentists prefer placing materials like composite instead of amalgam fillings whenever possible. Generally, composite fillings are used to fill a carious lesion involving highly visible areas (such as the central incisors or any other teeth that can be seen when smiling) or when conservation of tooth structure is a top priority. The bond of composite resin to tooth, is especially effected by moisture contamination and cleanliness of the prepared surface. Other materials can be selected when restoring teeth where moisture control techniques are not effective. These fillings are a mixture of glass and an organic acid. Although they are tooth-colored, glass ionomers vary in translucency. Although glass ionomers can be used to achieve an aesthetic result, their aesthetic potential does not measure up to that provided by composite resins. The cavity preparation of a glass ionomer filling is the same as a composite resin; it is considered a fairly conservative procedure as the bare minimum of tooth structure should be removed. Conventional glass ionomers are chemically set via an acid-base reaction. Upon mixing of the material components, there is no light cure needed to harden the material once placed in the cavity preparation. After the initial set, glass ionomers still need time to fully set and harden. They are not subject to shrinkage and microleakage, as the bonding mechanism is an acid-base reaction and not a polymerization reaction. Glass ionomers contain and release fluoride, which is important to preventing carious lesions. Furthermore, as glass ionomers release their fluoride, they can be "recharged" by the use of fluoride-containing toothpaste. Hence, they can be used as a treatment modality for patients who are at high risk for caries. 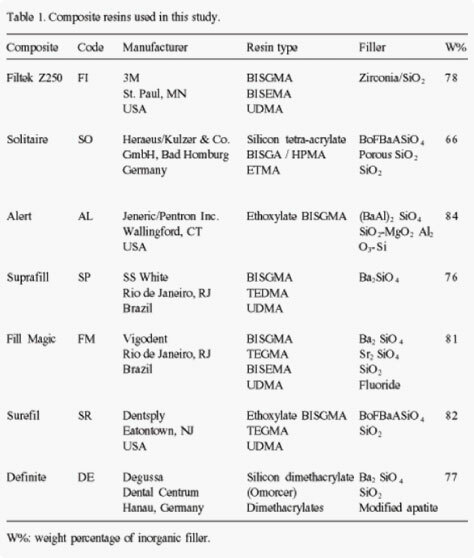 Newer formulations of glass ionomers that contain light-cured resins can achieve a greater aesthetic result, but do not release fluoride as well as conventional glass ionomers. Glass ionomers are about as expensive as composite resin. The fillings do not wear as well as composite resin fillings. Still, they are generally considered good materials to use for root caries and for sealants. A combination of glass-ionomer and composite resin, these fillings are a mixture of glass, an organic acid, and resin polymer that harden when light cured. (The light activates a catalyst in the cement that causes it to cure in seconds.) The cost is similar to composite resin. It holds up better than glass ionomer, but not as well as composite resin, and is not recommended for biting surfaces of adult teeth. In general, resin modified glass-ionomer cements can achieve a better aesthetic result than conventional glass ionomers, but not as good as pure composites. Porcelain fillings are hard, but can cause wear on opposing teeth. They are brittle and are not always recommended for molar fillings. Gold fillings have excellent durability, wear well, and do not cause excessive wear to the opposing teeth, but they do conduct heat and cold, which can be irritating. There are two categories of gold fillings, cast gold fillings (gold inlays and onlays) made with 14 or 18 kt gold, and gold foil made with pure 24 kt gold that is burnished layer by layer. For years, they have been considered the benchmark of restorative dental materials. Recent advances in dental porcelains and consumer focus on aesthetic results have caused demand for gold fillings to drop in favor of advanced composites and porcelain veneers and crowns. Gold fillings are usually quite expensive, although they do last a very long time. It is not uncommon for a gold crown to last 30 years. Lead fillings were used in the 1700s, but became unpopular in the 1800s because of their softness. This was before lead poisoning was understood. According to American Civil War-era dental handbooks from the mid-1800s, since the early 1800s metallic fillings had been used, made of lead, gold, tin, platinum, silver, aluminum, or amalgam. A pellet was rolled slightly larger than the cavity, condensed into place with instruments, then shaped and polished in the patient's mouth. The filling was usually left "high", with final condensation - "tamping down" - occurring while the patient chewed food. Gold foil was the most popular and preferred filling material during the Civil War. Tin and amalgam were also popular due to lower cost, but were held in lower regard. Gold foil: Preferred because of its durability and safety. Platinum: Was rarely used because it was too hard, inflexible and difficult to form into foil. Aluminum: A material which failed because of its lack of malleability but has been added to some amalgams. Tin and iron: Believed to have been a very popular filling material during the Civil War. Tin foil was recommended when a cheaper material than gold was requested by the patient, however tin wore down rapidly and even if it could be replaced cheaply and quickly, there was a concern, specifically from Harris, that it would oxidise in the mouth and thus cause a recurrence of caries. Due to the blackening, tin was only recommended for posterior teeth. Thorium: Radioactivity was unknown at that time, and the dentist probably thought he was working with tin. Lead and tungsten mixture, probably coming from shotgun pellets. Lead was rarely used in the 19th century, it is soft and quickly worn down by mastication, and had known harmful health effects. Amalgam: The most popular amalgam was a mixture of silver, tin and mercury. According to the authors of the article "It set very hard and lasted for many years, the major contradiction being that it oxidized in the mouth, turning teeth black. Also the mercury contained in the amalgam was thought at that time to be harmful." as explained in the pre-eminent dental textbook of that century, The Principles and Practice of Dental Surgery by Chapin A. Harris A.M., M.D., D.D.S.. Fillings have a finite lifespan: an average of 12.8 years for amalgam and 7.8 years for composite resins. Fillings fail because of changes in the filling, tooth or the bond between them. Amalgam fillings expand with age, possibly cracking the tooth and requiring repair and filling replacement. Composite fillings shrink with age and may pull away from the tooth allowing leakage. As chewing applies considerable pressure on the tooth, the filling may crack, allowing seepage and eventual decay in the tooth underneath. The tooth itself may be weakened by the filling and crack under the pressure of chewing. That will require further repairs to the tooth and replacement of the filling. If fillings leak or if the original bond is inadequate, the bond may fail even if the filling and tooth are otherwise unchanged. The Nordic Institute of Dental Materials (NIOM) evaluates dental materials in the Nordic countries. This research and testing institution are accredited to perform several test procedures for dental products. In Europe, dental materials are classified as medical devices according to the Medical Devices Directive. In USA, the U.S. Food and Drug Administration is the regulatory body for dental products. Copyright © 2018 Joon Dental Clinic. All rights reserved.